We were on the way back from McArthur's Head lighthouse, having walked along the shore after exploring the caves below the lighthouse (more about that some other time). This small beach has some of the nicest golden white sand I can think of on Islay. On the way out we had spotted an Otter on this beach. I have some pictures of it, unfortunately it was quite far away and they aren't very good. As usual the larger version (larger as is more than twice as big) will go on to the Islay Pictures photoblog tomorrow morning. 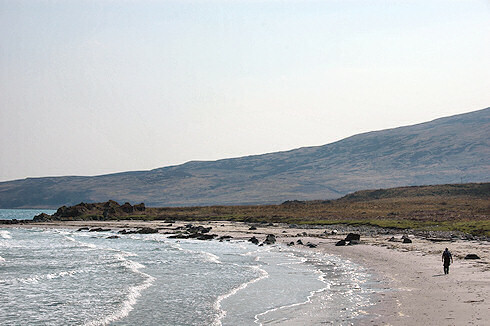 If you're after pictures from the Islay walking week you can find several in the [WalkIslay 2009] category there. Even more can be found through the Islay Walking Week 2009 pages I've kicked off, go to the WalkIslay 2009 press pictures page. I think that's enough pictures for this evening. Have a great weekend, whereever you are and whatever your plans for the weekend are!